Thank you for your continued generosity to the Renew Project! 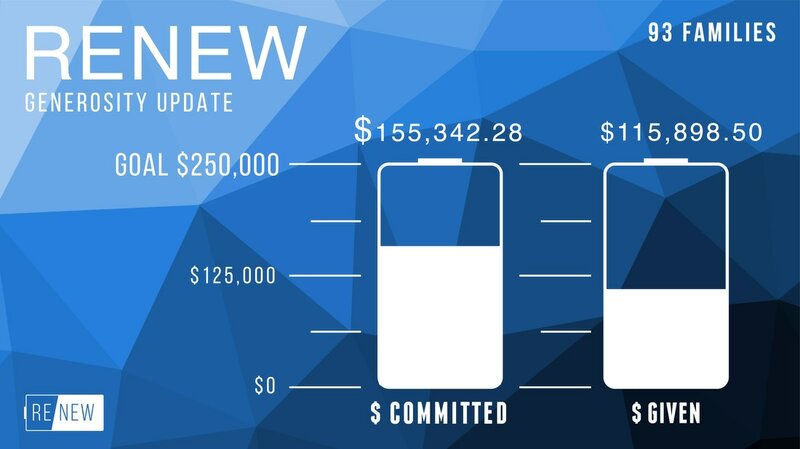 How amazing that over $120,000 has been given to date. It’s not too late to partner with the 95 other Cold Springs families committed in generosity to be a church for the next generation. You can participate through prayer and giving via check or online at www.coldspringschurch.net. Watch for Pastor David’s Renew letter in your mail! Don’t forget to join us as we celebrate all that God has done on Sunday, September 17! 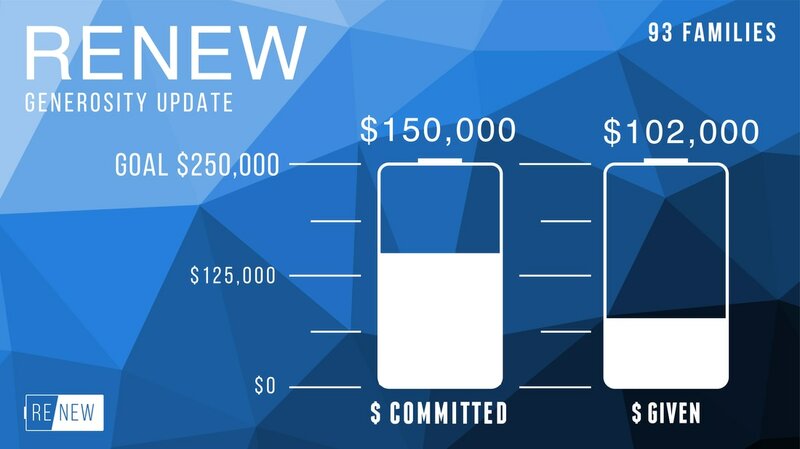 Cold Springs has tithed over $12,000 from our Renew Project giving to our Special Missions Fund. This special fund is designated for unbudgeted mission opportunities that arise throughout the year for Cold Springs to make a difference in our community and our world. 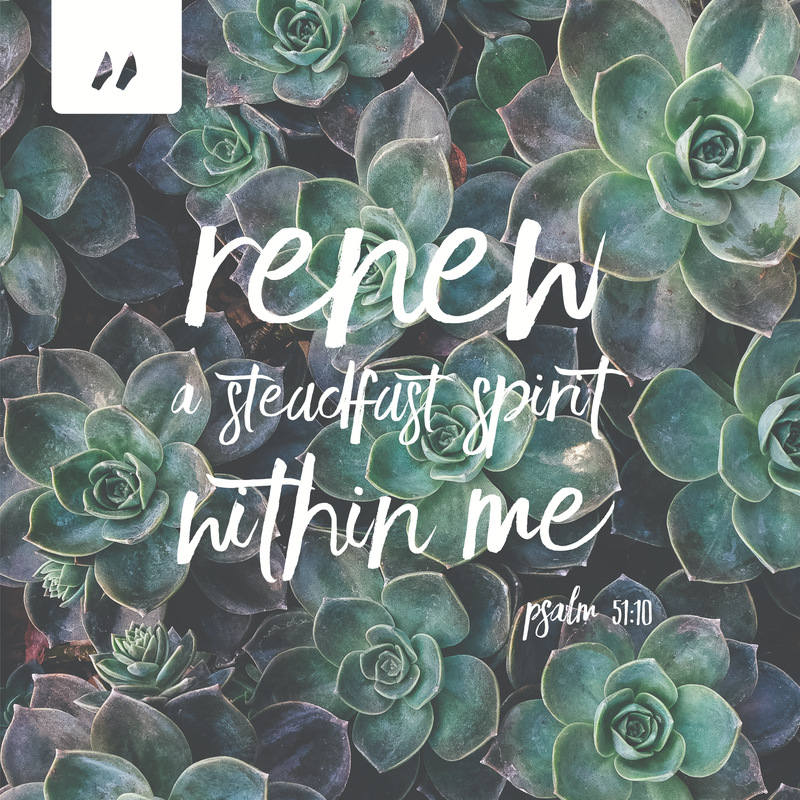 Some ministries we have given to through Renew Project tithes: Pregnancy Counseling Services, Hidden Abilities-Ethiopia, Hope House, 3-Strands Ministry. Upcoming – Fall 2017: Church exterior painting is our final project. Renew Project Celebration… Join us as we celebrate on our final day of giving, September 17! Thank you for your continued generosity to the Renew Project! How amazing that over $105,000.00 has been given to date. It’s not too late to mail or bring in your commitment card and partner with the 94 other families giving to be a church for the next generation. Commitment cards are available at the Welcome Center and you can also utilize our online giving to give toward the Renew Project. Keep watch for monthly updates on Renew Project improvements and impact! Every month Cold Springs tithes from our Renew Project giving to our Special Missions Fund. This special fund is designated for unbudgeted mission opportunities that arise throughout the year for Cold Springs to make a difference in our community and our world. Some ministries we have given to: Pregnancy Counseling Services, Hidden Abilities-Ethiopia, Hope House, 3-Strands Ministry. -Our new church sign by the road is up! 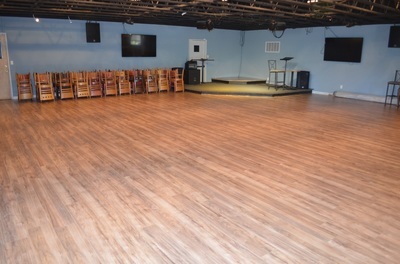 -Worship Center new stage completed! To Be Determined: Church exterior painting and various building repairs in planning stages. SEPTEMBER UPDATE - PROJECTS UNDERWAY! Thank you for your continued generosity to the Renew Project! 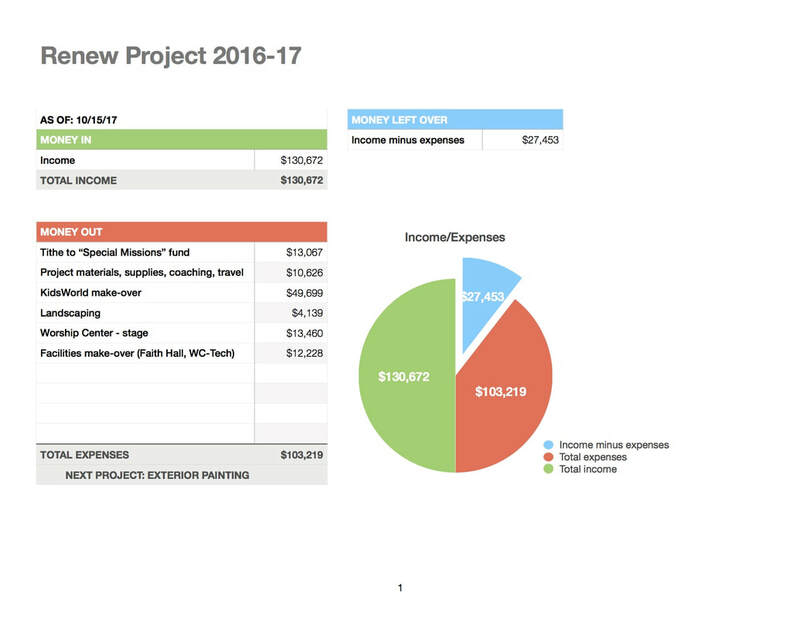 How amazing that $77,800.00 has been given to date. It’s not too late to mail or bring in your commitment card and partner with the 93 other families giving to be a church for the next generation. Commitment cards are available at the Welcome Center and you can also utilize our online giving to give toward the Renew Project. Keep watch for monthly updates on Renew Project improvements and impact! Every month Cold Springs tithes from our Renew Project giving to our Special Missions Fund. This special fund is designated for unbudgeted mission opportunities that arise throughout the year for Cold Springs to make a difference in our community and our world. Our new church sign by the road is up! 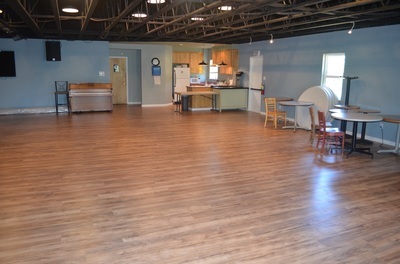 KidsWorld Remodel Phase 1 is complete and operational! KidsWorld Phase 2 is in progress with hallway painting and new doors installed! KidsWorld Phase 3 - painting classrooms. Church exterior painting and various building repairs in planning stages. RENEW UPDATE FOR JULY - BIG THINGS FOR KIDSWORLD! Thank you for your continued generosity to the Renew Project! How amazing that over $68,000.00 has been given to date. Even more exciting is that projects are underway and you are able to see the fruit from your financial sowing and see the impact it has in the lives of families and kids here at Cold Springs. It’s not too late to mail or bring in your commitment card and partner with the 88 other families giving to be a church for the next generation. Commitment cards are available at the Welcome Center and you can also utilize our online giving to give toward the Renew Project. Keep watch for monthly updates on Renew Project improvements and impact! ​KidsWorld Remodel Phase 1 is happening this month! Keep watch for the reveal on Sunday, July 31st. The work has started in preparation for our Worlds of Wow makeover. Worlds of Wow asked us to paint Blue Bell Blue as their base mural paint and Pastor David & Dwight Fuller went to work painting first thing Monday, July 11. The Worlds of Wow crew are scheduled to be here at Cold Springs Church Monday, July 18 to begin the transformation of our check-in/welcome area for KidsWorld. They were so excited to see the great blue canvas, and can't wait to transform this space with loads of color and images...and WE CAN'T wait to share this with our amazing kiddos here at Cold Springs Church! YOU DON'T WANT TO MISS our big reveal happening July 31st. Coming this fall – The Church exterior is scheduled for a much needed painting and our children’s playground is set to get a shade structure. Thank you for your continued generosity to the Renew Project! How amazing that over $55,000.00 has been given to date. It’s not too late to mail or bring in your commitment card and partner with the 83 other families giving to be a church for the next generation. Commitment cards are available at the Welcome Center and you can also utilize our online giving to give toward the Renew Project. 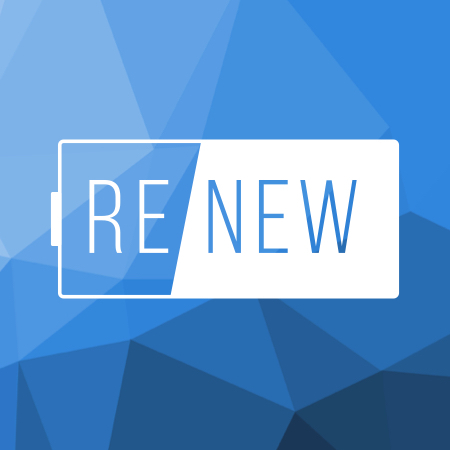 Keep watch for monthly updates on Renew Project improvements and impact! To date Cold Springs has tithed $5,000.00 from the Renew Project giving to our local Pregnancy Counseling Services on Main Street. These funds went towards their Renovation Project which includes facilities updating/remodeling and new resources. Watch for their open house where you can learn more about this great community organization! Our design team is set to install KidsWorld remodel in late August/early September! WHAT’S NEXT & HOW YOU CAN HELP! KidsWorld Phase 1 is coming this summer! Painters: opportunities to offer your time and efforts are coming! If interested, please mark your Welcome Card or email/call the church office. Someone will contact you directly. GENEROSITY SUNDAY - A GREAT START! 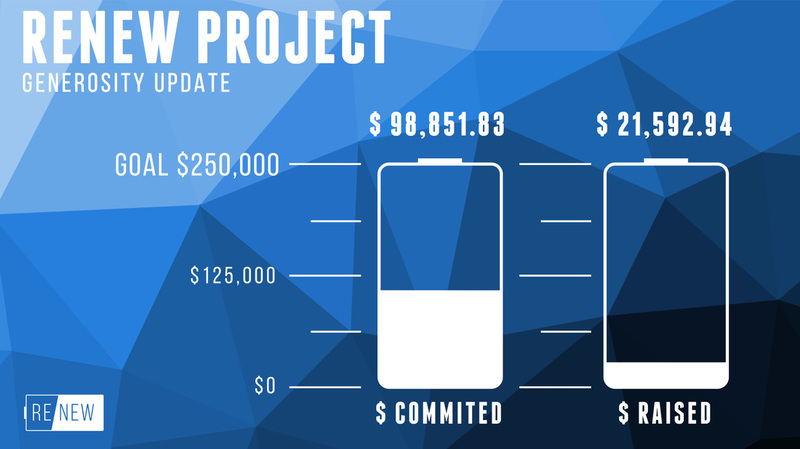 Thank you for a great start to the Renew Project! How amazing that over $20,000 has already been given. For anyone still hoping to join, it’s not too late to mail or bring in your commitment card and partner with the 65 other families giving to be a church for the next generation. Commitment cards will be available at the Welcome Center and you can also utilize our online giving to give toward the Renew Project. 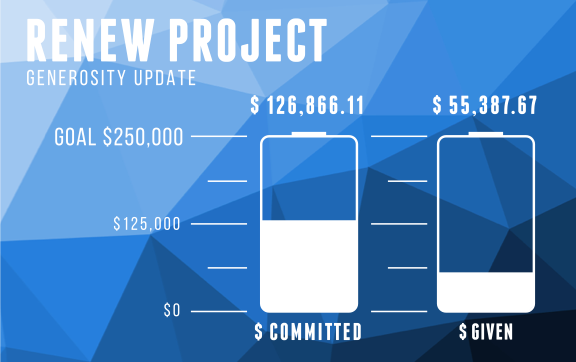 ​Keep watch for updates on Renew Project improvements and impact!